98% of UK TV viewing still takes place on a television | What Hi-Fi? New TV viewing figures released today reveal that the television is still by far the most popular method of watching TV, despite the rise in popularity of smartphones, tablets and streaming TV apps. The average UK viewer watched a hefty three hours and 55 minutes of TV a day in 2013, with 98.5% of this average daily viewing done using a TV set. That average viewing time figure was down by 9 minutes compared to 2012, due in part to the hugely popular Olympics coverage. By contrast, the average person watched just over three minutes a day on smartphones and tablets. However, this figure was up by 30 seconds year-on-year, a jump of around 20%. The viewing figures from industry body Barb, the Broadcasters' Audience Research Board, and reported by the Guardian, also showed that while on-demand viewing is on the rise, it remains a relatively small percentage of TV viewing. Live TV made up 88.7% of all viewing in 2013, down from 89.9%, though in households that had a digital TV recorder, this figure dropped further to 83.6%. So, naturally, as the number of households with a TV recorder of some description increases, the number of TV programmes watched live will decrease. 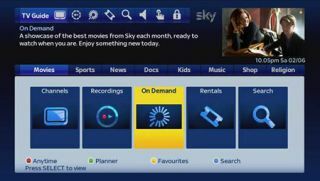 The likes of Sky, Virgin and YouView have made on-demand TV central to their TV offerings, with a new look Sky EPG set to make catch-up and on-demand content even easier to find when it rolls out later this year. Elsewhere the report shows that 81% of all recorded or catch-up TV viewing is watched within 2 days of recording/broadcast, while 47% is watched within 24 hours. Commercial broadcasters' share of UK TV viewing also rose in 2013, up from 66% in 2012 to 68%. So, the amount of TV being watched on mobile phones and tablets may be on the rise but it seems there's a fair way to go before the TV is threatened as the main device for watching TV for the average UK viewer.